The recording I’m going to share with you today is considered one of the most important traditional Korean recordings ever issued during the 78rpm era. First, I’d like to share some historical details. These will help you understand this recording a little bit better. A-Ak (Korean: 아악, 雅樂) is a type of Korean court music that was partly modeled on the court music of Song Dynasty China, known as Yayue1. Earliest historical documentation of this type of music dates back as early as 1116, after King Yejong (r. 1105-1122) of the Goryeo dynasty (918-1392 CE) ordered his musicians to play ritual music and other court music with a large quantity of Chinese musical instruments sent from the Song Dynasty Emperor Huizong. A-Ak was apparently played quite regularly in the court until the Mongol invasion of late 13th century, after which interest waned and it was seldom performed. After the dynasty of Joseon (1392-1910 CE) was established, an interest in A-Ak was revived. In 1430, King Sejong the Great (r. 1418-1450), arguably the most influential historical figure in Korean history, ordered his courtiers to reestablish the entire arrangements of old A-Ak pieces with a new musical notation system called “Jeongganbo”2 (Korean: 정간보, 井間譜, literally translated as “Well Notations”). 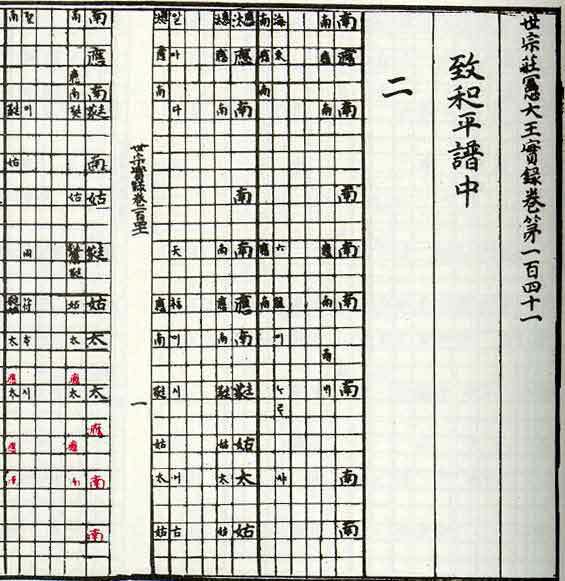 Two A-Ak compositions written in this system, both by King Sejong himself, titled “Botaepyeong” (Korean: 보태평, 保太平), and “Jeongdaeeop” (Korean: 정대업, 定大業), were performed for centuries at important events such as the Royal Ancestral Ritual in the Jongmyo Royal Shrine. 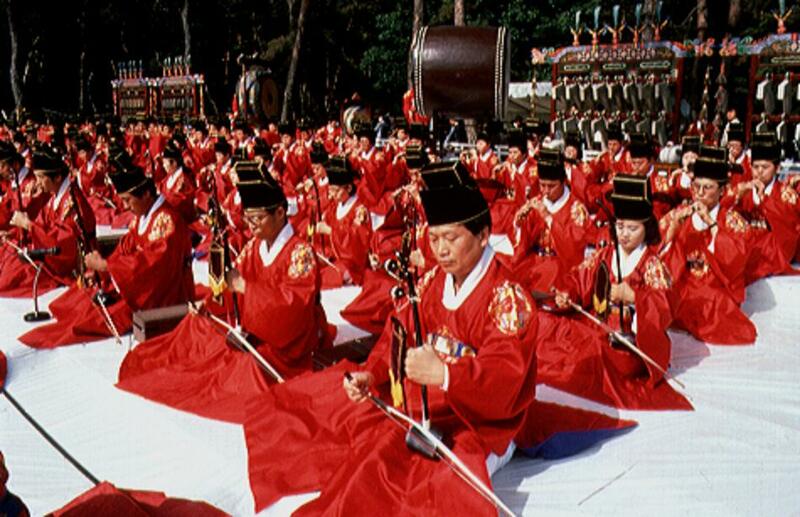 Until the late 19th century, A-Ak was performed by the court musicians at Jangakwon (Korean: 장악원, 掌樂院), a government office responsible for court musicians and dancers. The office was dissolved in 1895 under western influences to ‘modernize’ the centuries’ old system. After that, Jangakwon musicians worked for a variety of occasions for more than a decade, but the occasions became fewer with the demise of Joseon Dynasty, which ended in August 1910 with the Japanese colonization of Korea. In 1911, with orders from Japanese government, a special office called “Yiwangjik”3 (Korean: 이왕직, 李王職) was established in Seoul. 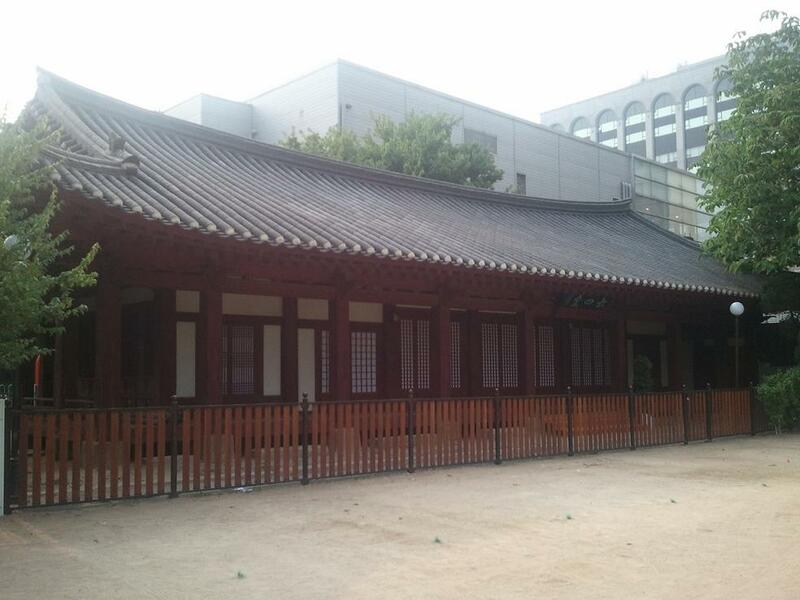 The main purpose of this office was to take charge of business that involved Royal family members of Joseon dynasty, including King Gojong (r. 1863-1907, d. 1919) and his son King Sunjong (r. 1907-1910, d. 1926), who were still residing in palaces. The Yiwangjik then absorbed most of the officials involved in court activities, including 184 musicians from Jangakwon. These musicians then formed the “Yiwangjik A-Ak Band” in 1912 to perform for the old royal members, but as the Yiwangjik gradually began to reduce the budget for the A-Ak Band (for what were explained as “practical reasons”4), the musicians began to fall out from the band, and by 1917, there were only 54 members present, with most of the musicians in their sixties. Like many centuries-old traditions, it appeared the whole A-Ak genre would bite the dust within a few years, but two notable events occurred which turned out to be turning points in the music’s history. 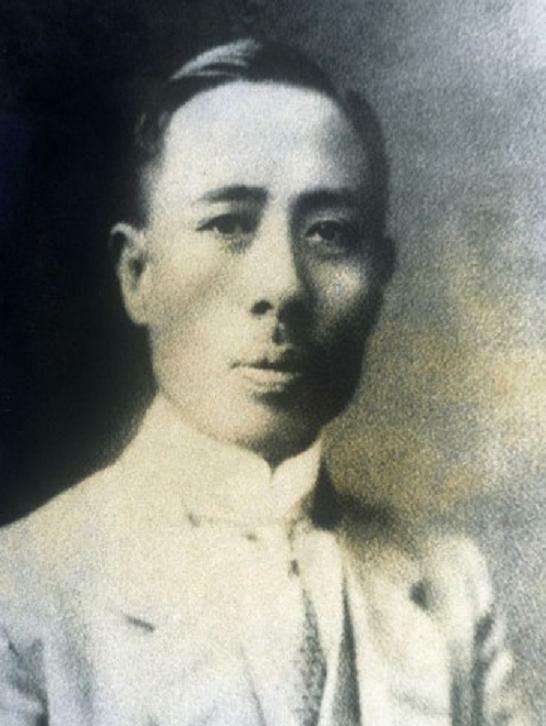 Ham Hwa-jin, (Korean: 함화진, 咸和鎭, 1884-1948), a master of Gayagum and Geomungo (Korean string instruments), was one of the older Jangakwon musicians and the de facto leader of the band at the time5. He figured that the only way to prevent the eventual group’s disbandment was to create a modern-style school devoted to creating new A-Ak musicians. With help from a few friends and fellow artists including his long time friend Kim Young-je (Korean: 김영제, 金寧濟, 1883-1954), he created the “Yiwangjik A-Ak Academy” (Korean: 이왕직아악전습소, 李王職雅樂傳習所) in September 1917. 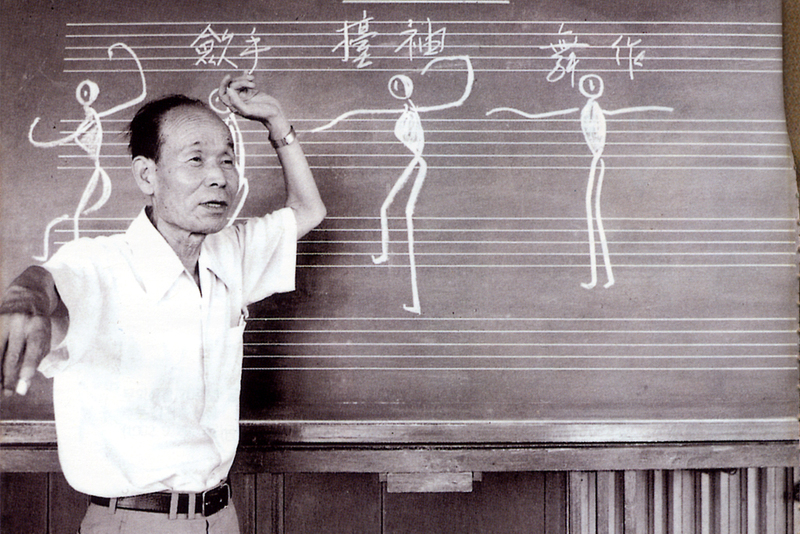 The curriculum included not only Korean traditional music, but also some basic western music theory including western-style musical notation methods. This certainly created some public interest. Nine students entered the first year, and by 1919, the number of students had tripled. However, even with the increasing public interest, the Yiwangjik still kept reducing the budget, and finally, by late 19206, they started to seriously consider the complete dissolution of the band. L-R: Master Ham Hwa-jin, Master Kim Young-je, Hisao Tanabe, 1960s. With this series of turning points, The Yiwangjik A-Ak Society became strong, performing a concert for the public for the first time in September 1922. In January 1926, they received a permanent studio just across from the Changdeok Palace, where King Sunjong and his family still lived. The A-Ak Academy drew 18 new students each year, making the total number of A-Ak society members more than 200 by 1928. The public drew their attention to the A-Ak Society, and even after the death of King Sunjong6/, the Society’s “official” chief patron, the Society saw little effect from the event. After the introduction of radio in Korea on February 16th, 1927, the Yiwangjik A-Ak Society decided to perform on the air. Their first radio performance was on November 3rd, 1927, and they made several additional appearances over the years. By this time, the Korean public was becoming aware of modern media such as newspapers and magazines, radio broadcasts, and of course, the gramophone and its records. The first commercial recordings of Korean music were issued on a series of Columbia records in 1907, and the US-based Victor Talking Machine company issued around 200 Korean recordings in 1908 and ca. 1915. But the clear winner of the Korean gramophone market7 during the 1910s and most of the 20s was the Nipponophone company of Japan. 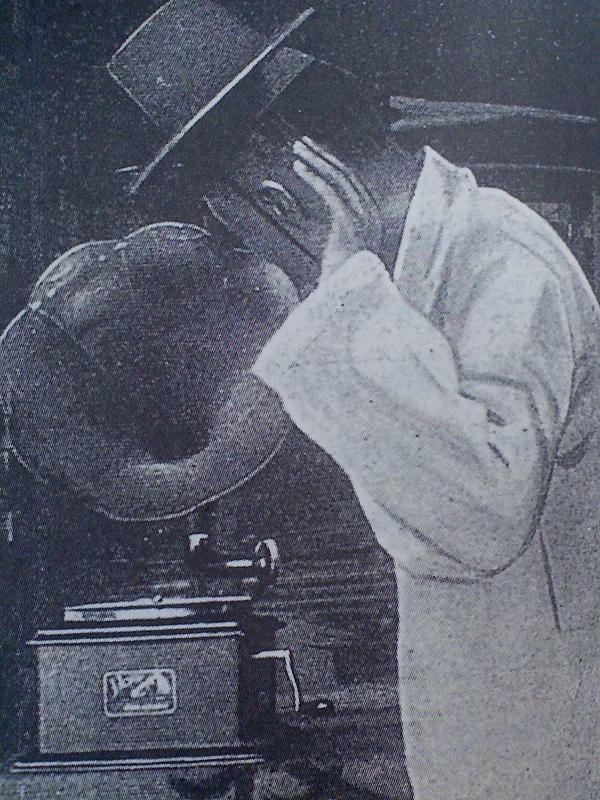 Nipponophone had their branch office established in Seoul in 1911 and dominated the Korean record market until the late 1920s. With the introduction of electrical recordings, however, things began to change. In September 1927, Victor established its Japanese subsidiary in Yokohama as “The Victor Talking Machine Company of Japan, Limited,” which later became known as “JVC.” Later that month, they issued the first Japanese electrical recordings, which literally revolutionized the whole record business in Japan. With this success, Victor started to seek other profitable markets, and Korea was considered. 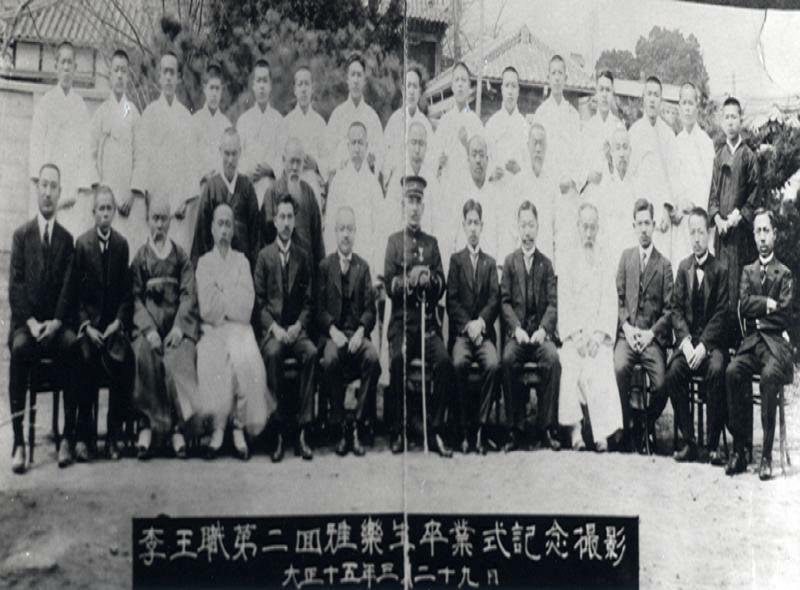 Several business arrangements followed, and on May 21st, 1928, Japanese Victor launched its branch office in Seoul, and among the performers they were seeking was the Yiwangjik A-Ak Society. It is not exactly known who came up with the idea of recording A-Ak pieces, but it appears that the renowned Japanese historian and college professor, Shogo Oda (Japanese: 小田省吾, 1871-1953), a close friend of the aforementioned Hisao Tanabe, was a talent scout for this occasion. It is possible that Oda was the one who made the decision under the influence of Tanabe. For this occasion, Victor brought two American recording engineers with a recording lathe, and installed it in one of studio buildings of the A-Ak Society called Yooksadang (Korean: 육사당, 六四堂), originally built in the late 17th century as a part of Royal guard headquarters. The building was seldomused by the A-Ak Society musicians, as it had fallen into disrepair and had very bad acoustics, yet it was the only building big enough to install the recording lathe. 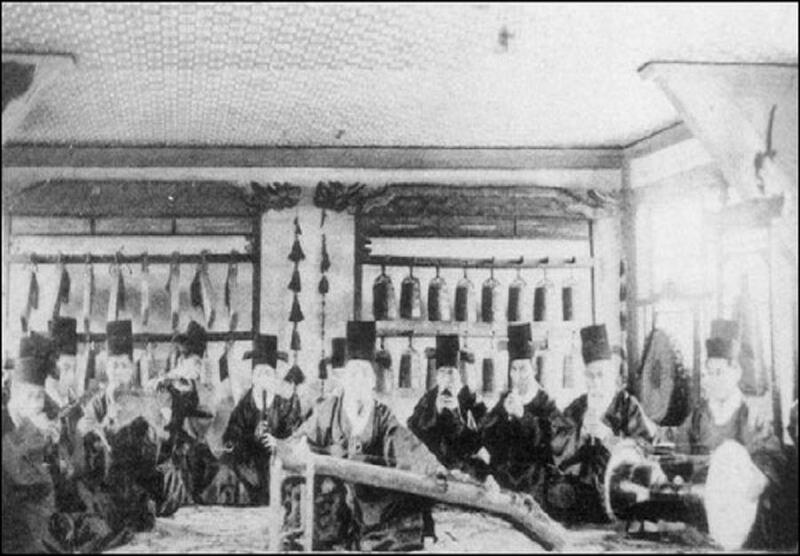 It is known that at the same time Victor also sent a different group of engineers to a separate studio for recording additional types of Korean music, such as Pansori, folk songs, instrumental ensembles, and even some “modern popular songs.” Judging by this, Victor apparently took the interest of recording A-Ak much more seriously than other styles. There are several eyewitness accounts of this recording session, including aforementioned notes by Master Seong, as well as a 1990 interview of another A-Ak master and court dance virtuoso, Master Kim Cheon-Heung (Korean: 김천흥, 金天興, 1909-2007)12. According to Master Kim, one of the string players at this session, the recording actually took place for about a week, starting June 15th with a total of 54 A-Ak society members participating. Notable personnel included Ham Hwa-jin and Kim Young-je as principal conductors13, Master Kim Kye-seon (Korean: 김계선, 金桂善, 1891-1943) who performed solos with the Daegeum (a type of flute made out of thick bamboo), Master Lee Sook-kyong (Korean: 이숙경, 李肅慶) and Jang In-sik (Korean: 장인식, 張寅湜, 1908-1980) who performed Geomungo solos, and Master Ha Kyu-il (Korean: 하규일, 河圭一, 1868-1937) who performed Gagok solos. All of these performers were considered the greatest virtuosos of each instrument and style at the time. Embarrassed by this reaction, Victor tried to persuade Master Ham to change his mind, but he no longer wanted to be a part of the project. The representatives at Victor feared the worst – losing 40,000 Yen16 without any fruition – so they sent some letters to some “powerful people” involved in the Yiwangjik, to place pressure on Master Ham and other A-Ak society members. After about a month, A-Ak society musicians finally relented to approve the issue of 12 sides, and later another 14 sides, thus approving a total of 26 sides (13 double-sided records) for issue. In order to prevent further problems with unsatisfactory sides, Master Ham requested Victor to give him the metal masters and test pressings of rejected sides. According to Master Seong and Master Kim, these materials were kept in the small room in the A-Ak Academy’s office building, but they were lost by fire during the Korean War, along with the complete first pressings of the issued sides along with the Orthophonic machine later given by Victor to the A-Ak society. It is not known when these records were first offered to the public, but the earliest known advertisement dates from December 14th, 1928, so it can be assumed that these recordings were issued no later than December 1928. They were given the prestigious Victor Red Seal label, the only Korean recordings ever issued with red seals. They were sold for 2 Yen each or 25 Yen for the whole set17, while ordinary black label Korean music releases were sold for 1 yen or less. They were also assigned a special block of catalogue numbers starting from 49801 through 49813, while other Korean Victor recordings were assigned the 49000 number range18. These records appeared in catalogs until about 1937, after which they were discontinued. Several of these recordings (12 sides, nos. 49815-49820) were later reissued as a set titled “The Essence of Chosun A-Ak” (Korean: 조선아악정수, 朝鮮雅樂精髓) in 1942. This set featured a 66-page booklet, “Short notes of Chosun Music” (Korean: 조선음악소고, 朝鮮音樂小考), written by none other than Master Ham Hwa-Jin, the conductor of the recordings. The circumstances surrounding this reissue are unknown, but it is true that during the Second World War, Japanese Victor reissued a number of ethnic recordings from Asian countries with the title of “Daitoa Ongaku Shusei (A Greater East Asian Music Compilation),” under the supervision of musicologist Hisao Tanabe19. So, it is possible that these A-Ak reissues were related to these ethnic music reissues as well. While these 1942 reissued discs, together with their fancy-looking original album, occasionally show up in good condition on the collectors’ market20, the first pressings rarely show up anywhere in any condition, possibly the direct evidence of their poor sales. The piece I’m going to share with you is from this original set of 1928 A-Ak recordings and is titled “Heemun” (Korean: 희문, 熙文, literally “Glorious Writings”), the first part of a larger scale A-Ak work, the aforementioned “Botaepyeong” (Korean: 보태평, 保太平, literally “Conserving the Peacefulness”). 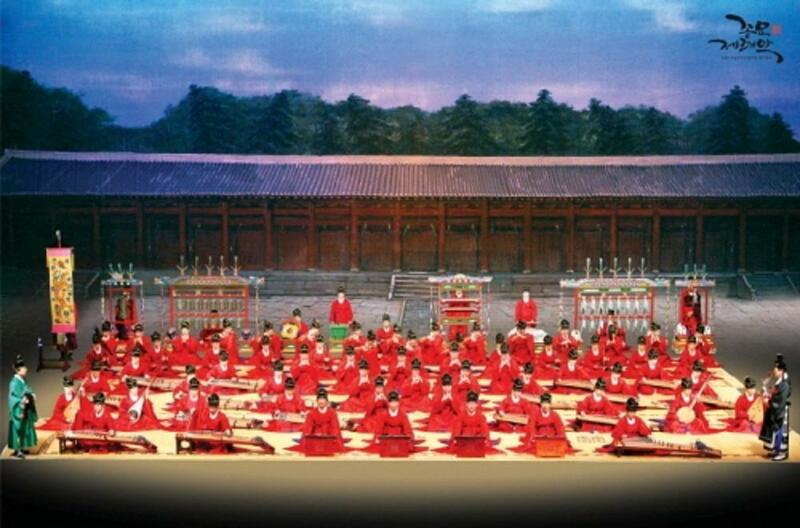 Botaepyeong has been performed at the Jongmyo Royal shrine during the memorial rituals which pay respects to the deceased Kings of the dynasty, and “Heemun” is performed to signal the opening of the entire ritual as well as during the first dedication of offerings to the spirits of the deceased. It has lyrics sung by Gagok singers, which are mostly about praising the dynasty and its descendants. The lyrics are only performed during actual services21, not during rehearsals or any other events, which is why they are not audible in this recording. These A-Ak recordings, even with the below-the-average sonic quality, are still considered to be some of the most important recordings of Korean traditional music ever captured during the 78rpm era. They feature a glimpse of A-Ak pieces performed in their “authentic” way – that is, as they were performed by the court musicians of the Joseon dynasty throughout the centuries. The performances in these recordings, compared to the modern recordings of A-Ak, sounds much higher in pitch and faster in rhythm22, with lots of prominent improvisations on strings. This sort of performance style is hardly seen today, as present day A-Ak performers tend to strictly rely on modern notations. Competitions followed. Nippon (Japan) Columbia, established in January 1928 by merger of Nipponophone and British-based Columbia’s branch office in Japan, started issuing Korean recordings in February 1929. 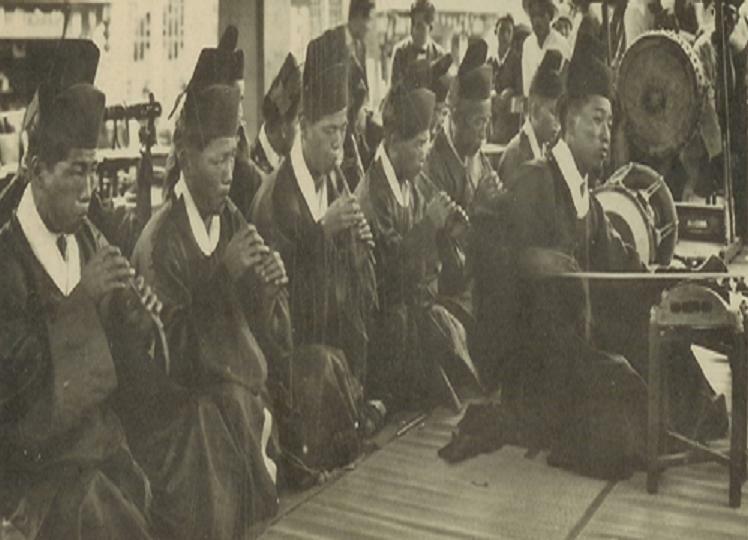 Among its first issues were a few recordings by the “Jeong-Ak Club” (Korean: 정악구락부, 正樂俱樂部), a small private performing and teaching group24 of A-Ak and other traditional ensembles. These were recorded considerably better than their Victor counterparts, but in terms of musical values, most of these recordings were popular pieces arranged in A-Ak style, so they are not in the same league as the Victor recordings. The Yiwangjik A-Ak Society continued to perform for the public. A notable performance was at the Seoul City Theater on October 7th, 1938, which drew thousands of people. 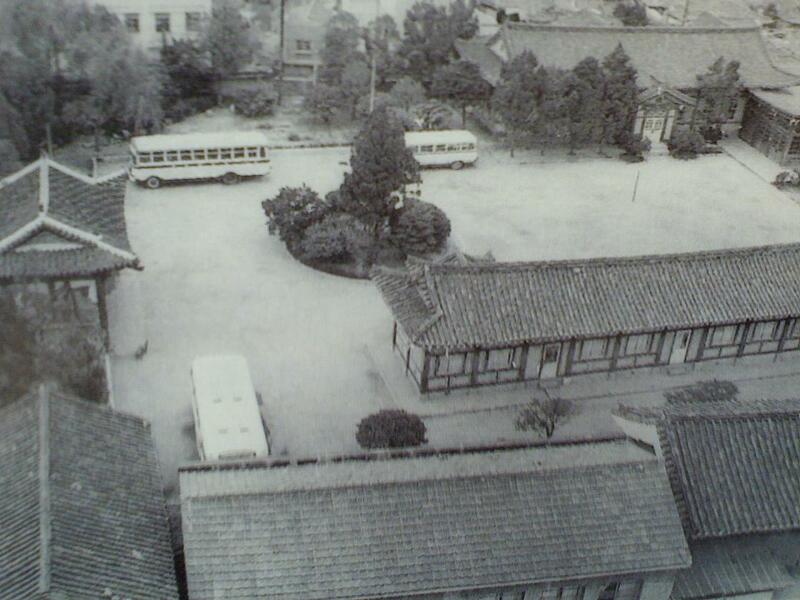 Even during the Second World War and the political repressions against Koreans, the society continued to perform. After Korea was liberated in 1945, the Yiwangjik was dissolved, but the A-Ak Society still survived as “Old Royal Court A-Ak Society” (Korean: 구왕궁아악부, 舊王宮雅樂部), and in 1951, under the special laws passed by the President and the National Assembly of Korea, it officially became The National Gugak25 Center of Korea26. They are still performing and teaching A-Ak and other traditional Korean music styles to the Korean public to this day. Recorded electrically on location in Seoul, ca. June 15th, 1928. Reissued on Victor (Japan) Red Seal Record 49815-B as a part of “The Essence of Chosun A-Ak” in November 1942. Reissue coupled with a side originally issued as 49808-A. 1“Yayue (Chinese),” “A-Ak (Korean),” and “Gagaku (Japanese),” are the local pronounciation of the same Chinese characters “雅樂.” Even though all three of them have the same origins from Tang China, all three of them are usually considered as totally different types of music. 3“Yiwang (Korean: 이왕, 李王)“ means “House of Yi (Lee)” – which was the clan of Royal family of the Joseon Dynasty. 5His father, Master Ham Jae-Woon (Korean; 함재운, 咸在韻, 1853-1916), was also a Gayageum player and the leader of A-Ak band from 1912 until his death. 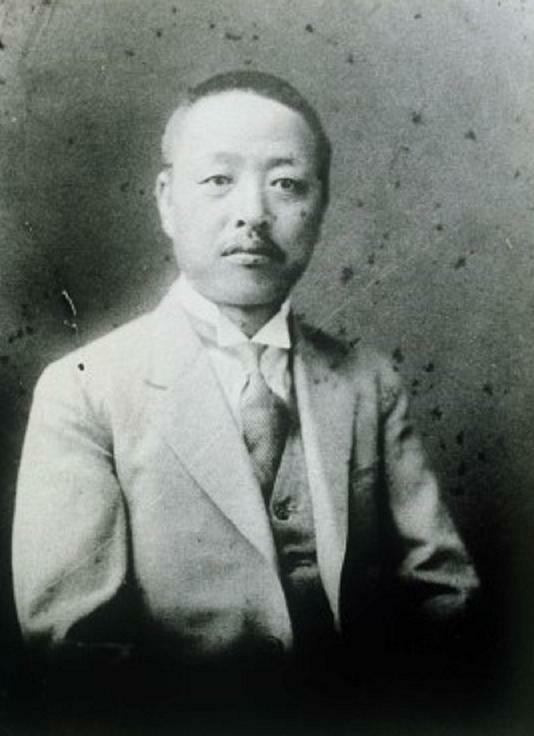 The official leader of the band was Master Myeong Wan-Byeok (Korean: 명완벽, 明完璧, 1842-1929), but because of old age and ill-health, he could not perform regularly at this point. 6Even after this, which occurred on April 25th, 1926, Yiwangjik was not dissolved, as the deceased King’s half-brother Prince Yeongchin, succeeded the position as the head of Yi household. 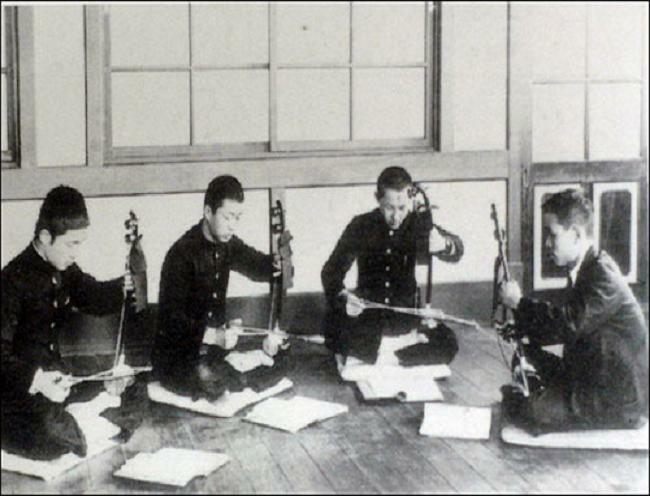 The Yiwangjik A-Ak Society continued to play for Prince Yeongchin and his family members as late as 1943. 7Until the introduction of few Korean recordings by Nitto Records in October 1926, Nipponophone was the only record company active in Korea. 8It appears the A-Ak society (at least some of the members) recorded a number of recordings for Nitto Records in 1926, although not a single copy of these recordings hasn’t been found. 9Anonymous. 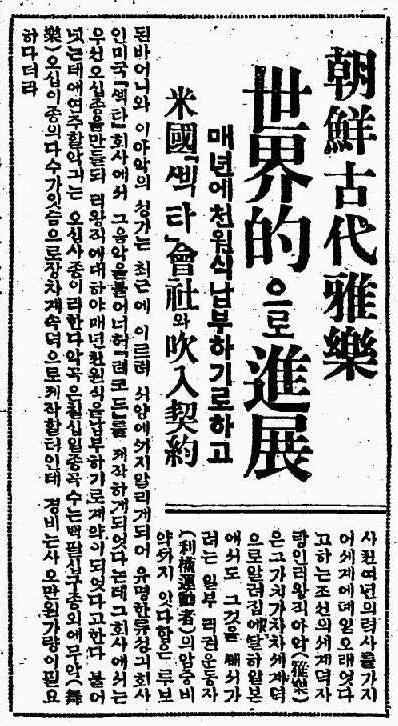 Ancient A-Ak Music of Chosun Goes Worldwide (朝鮮古代雅樂世界的으로前進), article from The Donga Ilbo (東亞日報), June 9th, 1928, p. 2. c. 4. 10Seong, Kyeong-lin, The A-Ak Records (아악레코–드), from the book, A-Ak of Korea (朝鮮의雅樂), Bakmun Publishing (博文出版社), Seoul, 1947. pp. 169 -173. 11Statistics shows that a middle-class Korean white-collar worker earned about 150 Yen a year in 1929, so the whole royalty was quite a big sum of money. 12Kim, Cheon-Heung, Reminiscence of Making 78rpm records (유성기음반취입회고) from, Korean Discography Journal (한국음반학), Vol.1, No.1. Korean Discography Research Society (한국고음반연구회), Seoul, 1991. pp. 267 – 268. 13Master Kim conducted all of the ritual music sides, while Master Ham conducted everything else. 14It appears that these technicians from Victor had not yet mastered proper microphone settings. Most of the other Korean Victor recordings from 1928 also suffers from hollow acoustics, which shows the distance between the performers and the microphone was too distant. Afterwards, Victor chose to record Korean artists in their own studio in Yokohama, Japan. The second Korean recordings sessions occurred around May 1929 and lasted until the final Korean Victor recordings of December 1941. 15Much of the A-Ak Society’s buildings were demolished in 1967 when the whole complex was sold to a private company, The Yooksadang building, however, somehow survived as a part of private property, albeit in a serious state of negligence. This writer actually trespassed (!) on to the private property to confirm the details regarding this building. The building, as you can see in the photo, is mostly built with wood with tiled roof. Inside the building there is a relatively big open space (72 x 40 x 9 feet, respectively) with wooden floors. This room gives enough space to gather 54 musicians, but there’s not much room to consider the sonic balance. There’s a small room at the Northeast corner of the building which is obviously the room where the recording lathe was installed. 16Ironically, according to Master Kim, after these tense situations were settled, the Yiwangjik used this money to build a sonically better studio for the A-Ak society in late 1929. 17It apparently could be bought as a whole set within a special album, although there’s no reported example of the album. 18Victor’s regular Korean issues on black label started from 49000 and went through 49491. Although there are several surviving Victor metal parts that carry the number after 49491 (the highest is 49508, reassigned to Victor Junior number), it is doubtful that the ones after 49491 actually carried the number when they were issued. 49491 was issued on November 1937. Afterwards, Korean recordings were only issued on Victor’s budget label called “Victor Junior,” which started with the number KJ-1001 (issued on February 1935) and ended with KJ-1386 (issued sometime in 1941). There are separate recordings appearing in the 49500 range (49500-49514), special recordings of operatic recordings sung by Korean opera singers, issued between December 1941 and November 1943. 19More information about “Daitoa Ongaku Shusei” and examples can be found on Haji Maji, here. 20The quality of shellac was more inferior than the 1928 pressings because of wartime shortages, but usually most of the examples appearing on the market tend to have less wear or scratches on them. 21According to some insider knowledge, this ‘common law’ was kept among the A-Ak musicians until the mid-1950s, but after Jongmyo Royal shrine rituals temporarily ceased to be performed during the Korean war and afterwards, nobody took this seriously, and as a result, modern day performances and recordings feature the lyrics most of the time. 22Here’s a field trip recording of the same piece (plus vocal Gagok parts) from 1966, recorded by Dr. Robert Garfias. 23Kim, Dong-hwan (김동환 金東煥), Na, Woon-Kyu (나운규 羅雲奎), etc. Impressions on Mr. Sternberg – Interviews and Discussions with an international artiste and leading Korean film stars. (스탄–벅印象, 世界的巨匠과朝鮮映畵人間座談會), Samchullee (“3,000 Leagues”, 三千里) Magazine, Vol, 8, No. 11., 1st November, 1936. Seoul, Samchullee Publishing (三千里社), pp. 164-165. 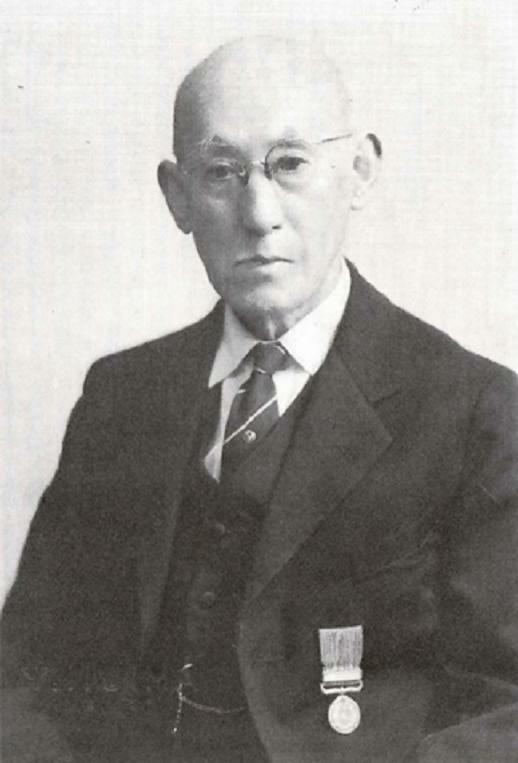 24Master Kim Kye-Seon, the Daegeum virtuoso who participated in Victor’s A-Ak Society recordings, was also a member of this Jeong-ak Club, and it is interesting to compare his recordings on Victor and Columbia. 25Gugak (Korean: 국악, 國樂) is the term that applies to all sorts of traditional Korean music. 26The National Gugak Center of Korea issued a special private CD in 1991, commemorating the 40th anniversary of its creation. It contains the whole 1942 Victor reissue set, as well as few other 78rpm recordings containing A-Ak or other folk ensembles. The CD actually tarnished the reputation of these legendary recordings, however, as all of the recordings featured in this CD were re-recorded by playing the original discs on a cheap portable gramophone, therefore badly distorting further the sound of the originals. incredible, so haunting. look forward to reading all about it tomorrow. thanks for all the other incredible tracks you’ve shared too, this place is an inspiration. Fantastic work Mark! And thanks for hosting ES! I’ll have to check again, but the only series that contains some Korean records which seems to have history cards is the 42000 series (mostly Chinese, but also some Korean and Filipino discs). I don’t believe there is any info on those cards beyond the catalog number, though. Some are bare bones. Not sure whether I’m more overwhelmed by the beauty of the music, or with fascination at the richness of historical detail in Mark’s annotations. Fantastic achievement, and one I’ll come back to again and again, I think. Thank you for this amazing and informative post. But where can we listen to the recordings?